This is an original review by Jbidet.com of the Ellegantz GenieBidet seat. Ellegantz is a Canadian company that only started making bidets since 2015, which is the reason why you may have never heard of this company. The GenieBidet is an non-electric bidet. Because they are relatively easy to make, you will find many non-electric bidets made by startups and smaller unknown companies. Still, we have heard many good things about this bidet seat, so today we wanted to take an in-depth look at the seat with you. As usual we will begin the review by taking a look at the appearance, dimensions, and built of the Ellegantz GenieBidet seat. The Ellegantz GenieBidet has a clean, simple design. As a non-electric bidet, it doesn’t have many buttons like the electric bidets do. So the toilet seat almost looks like your existing one. On the side of the toilet seat there is a simple lever to activate the spray and a hose connecting the water supply. The hose and a t-shaped connector are included with the product. On the other side of the bidet seat, there is a dismantling button to remove the seat for cleaning. The Ellegantz GenieBidet is available in two designs: elongated and round. You should be able to see what kind of toilet you have simply by looking at it. Precisely, elongated toilets are about 18.5 inches long from the mounting bolts at the back to the front, and round toilets are about 16.5 inches. Either of these models should fit either your 1 piece toilet or 2 piece toilet. However, it might not fit a French curve toilet, if you have one. We recommend checking with the manufacturer if you’re not sure if this product will fit your toilet. 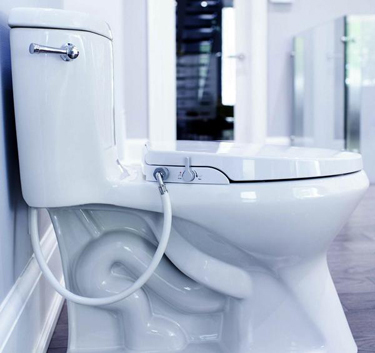 The elongated version of the Ellegantz GenieBidet can be adjusted to fit elongated toilets between 16.5” and 18.5” long. It measures 14.5” wide. 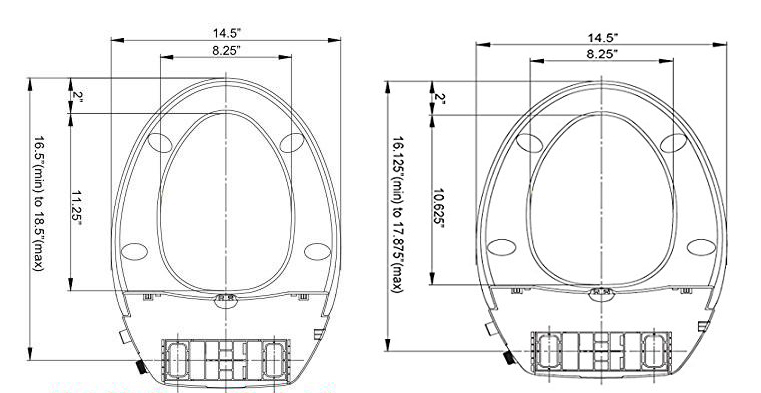 The round version can fit round toilets between 16.125” and 17.875” long. It also measures 14.5” wide. The Ellegantz GenieBidet seat comes in white. The only feature this bidet and all the other non-electric bidet seats offer is wash. This bidet seat has two spray jets. When you turn the lever clockwise from the vertical position, it will activate the Rear wash. When you turn the lever counterclockwise it will activate the Front wash. To turn off each of the washes, simply move the lever back to the vertical position. As a non-electric bidet, it doesn’t warm up water. You simply take whatever temperature water your water supply provides. But if you use hot water with the bidet, to avoid injury, do not use water higher than 40°C or 104°F. Choosing a bidet toilet seat can be a difficult decision. There are many products on the market and it’s not easy to see what features you get with each product. To help with your decision, we put together some reasons why the Ellegantz bidet might be the one you’re looking for. One of the drawbacks with this product is we don’t know how it performs in the long-run. This bidet seat is made by a relatively new company and while it performs well, we are unsure about its durability or customer support. That said, the lack of electric components means there is less that can go wrong with the product. Ellegantz offers a one-year warranty on the GenieBidet. The other small quirk about this bidet seat is that the hose connecting the water supply and the bidet seat can be aesthetically unpleasant for some people. 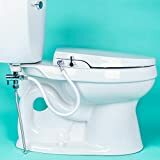 If you’re shopping for a non-electric bidet seat, the Ellegantz GenieBidet is one of the more well-designed and affordable on the market. We like how it looks on the toilet, despite the hose that sticks out to the side. We like how it functions. It’s nice that it has two different sprays. It’s simple to use – just turn the lever. It’s simple to install – there are no eletric components. All in all, we were very pleased with this bidet. The GenieBidet is only available online as far as we know. You can purchase the Ellegantz GenieBidet through Amazon or Shopify.